When designing your room for technology use you need to organize the technology equipment for easy access and usage. We put our computers in a cart. 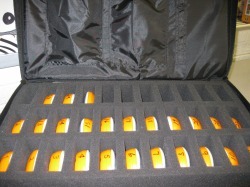 The cart can be organized with numbers or student names so students can locate their computer quickly and easily. 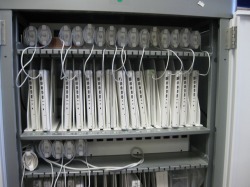 This way students don't have to look through each slot in the cart to find their computer. We also have found it beneficial if students use the same computer each time. This makes them accountable for only one computer; then if a problem does arise, the teacher knows who is responsible. 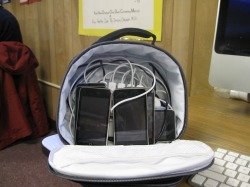 We have placed our six ipods, a USB hub, cords in a small lunch bag. This is easy to carry from room to room and keeps everything in one place. The Activexpressions are kept in their own bag along with the accessories. We have assigned each student a number and placed a number on each expression. 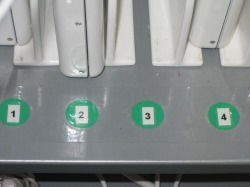 When in use, students use the expression with their assigned number. This way teachers can keep track of data collected from activities and assign students grades.